Your winners of the PMA 2016 Awards of Excellence in Metalforming—each winner received a plaque, commemorative flag and cash prize. Note that no winners were selected for the Link Systems Process Control Award and the Pridgeon & Clay Excellence in Quality Award. Federal Tool & Engineering, LLC, West Bend, WI, received the 2016 Higgins-Caditz Design Award. The company provides metal components and manual assemblies to OEMs in the food-service-equipment, power-generation, on- and off -highway transportation, commercial-lighting and consumer-appliance markets. Federal Tool & Engineering won the award for its redesign of a mounting bracket used to secure heating cables to the exterior of commercial foodservice ovens. 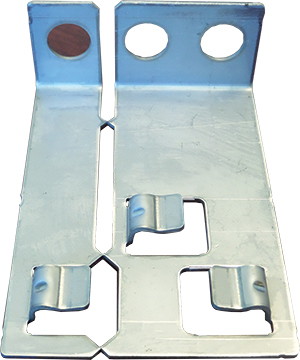 Based on the size of the oven, either a single-, double- or triple-hole version of the mounting bracket is used. Previously, each bracket was made independently—pierce and blank on a turret press or laser, bend on a press brake, tumble-deburr and spot weld—with a total process time of 34 to 48 sec./part. A typical 2000-piece run would take as long as 26 hr. to process. With an annual volume of 45,000 pieces, annual process time exceeded 550 hrs. Additional concerns surrounded the storage, management and procurement of three different SKUs, in addition to the tabs welded to each bracket. Original fabricated parts were stored in separate bins and logged a total process time of 34 to 48 sec./part. The newly redesigned part is stamped in a progressive die, with a cycle time of 5 to 6 sec. Following the redesign, the company now stamps a single part, from Type 304 stainless steel, in a 165-ton press using a progressive die. The part is produced in a triple-hole version, with the ability to split the part into a single-hole and a double-hole bracket. Total process time has been reduced to 5 to 6 sec., so that a 2000-piece run takes 4 hr. Lead time was reduced from six to two weeks; the company has less cash tied to inventory; and annual “all-in” savings are estimated to be $155,000. The new design has eliminated three press and post-press operations. Additionally, the original part was shipped to the customer, who then purchased and spot-welded two or three clips to it. Also, parts were stored in three separate bins. Now, the customer receives a complete part that requires no further operations, and it can be stored as a single part number until separation is necessary. Created by the Worcester Pressed Steel Co., Worcester, MA, and sponsored by The Quarterly Club, the design award recognizes a manufacturing company for outstanding achievement in developing an innovative product design. Excellence in Safety—E&E Manufacturing Co. Newly designed safety stop blocks can be placed easily into position without creating heavy-lifting hazards. E&E Manufacturing Co., Inc., Plymouth, MI, received the 2016 Pitcher Insurance Agency Safety Award, for developing two types of safety stop blocks designed to eliminate a possible hazard due to lifting heavy stop blocks into presses. E&E manufactures heavy-gauge stamped metal fasteners, progressive-die metal stampings and high-value-added assemblies for Tier One, Tier Two and OEM clients in the automotive, heavy-truck, military and other industries. The first style of stop block, a flip-up style, is referred to as the Easy Set stop block. While heavy, employees still can flip the blocks easily into position with the help of gas springs and shock absorbers to soften the landing. E&E also utilizes two safety switches on these blocks; these are automatically disengaged when the block is in the upright position. The Easy Set is equipped with air-assist on the adjustable-screw portion of the stop block. The second type of stop block created by E&E, known as the Snake, allows employees to simply press a button to move the stop block in and out of a press. It was designed for presses using other systems and features, such as transfer systems, that prohibit the use of the Easy Set. The Snake has a spring-loaded air-cylinder pin device that holds the stop block in its home position or in its location under the slide. The pin is released with a manually operated air valve attached to the side of the stop block. The link construction and assembly methods enable the Snake not only to support but to very easily move the heavy stop blocks. Excellence in Productivity—Tella Tool & Mfg. Co.
To more efficiently streamline packaging of high-volume parts, Tella Tool & Manufacturing developed a carousel that automatically orients, stacks and counts parts as they exit the press. 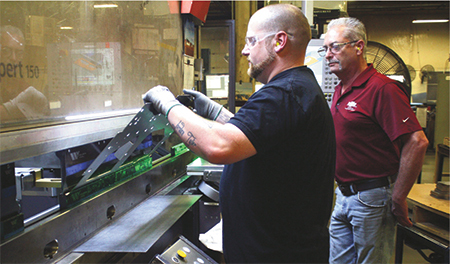 With its automated solution, the company can deliver accurate part stacks while increasing press speed by 48 percent and freeing two operators for other work as only one is needed for this operation. Tella Tool & Mfg. Co. received the 2016 Zierick Manufacturing Corporation Productivity Award for streamlining the packaging process on one of its high-volume production tools that produces more than three million parts per year. A cross-functional team was established to investigate and develop a more effective and efficient process. With locations in Lombard, IL, and Brownsville, TX, Tella Tool & Mfg. is a metal-stamping, fabrication and CNC machining business servicing, among others, the automotive, aerospace, defense and consumer-goods markets. The original process for stacking, weighing, packing and performing in-process inspection during the stamping process required three operators. With the press running at 37 strokes/min., parts, busbars, often became tangled and twisted sliding down the exit chute, leading to press stoppages and downtime. The busbars were then required to be manually weight-counted to ensure that 120 parts/bundle were properly orientated and wrapped with interleaf paper. Finally, three bundles were placed together into a carton ready for shipment. Also, bent parts from the stacking process caused issues with automated pick-and-place equipment at the customer. The Tella Tool & Mfg. cross-functional team brainstormed many ideas that finally led to the development of a machine called the Auto Stacker, an automated piece of equipment that orients, stacks and counts parts as they exit the press and travel down the conveyor. The Auto Stacker, designed and fabricated inhouse, includes 12 magazines situated evenly around a precision indexing carousel with cartridges engineered to wrap bundles with paper interleaf. PLCs and electronic sensors control automated indexing of magazines, timing of the servo motor and the number of parts needed per bundle. This new process enables one operator to complete the entire stamping and packaging operation, while effectively performing in-process inspection—without having to stop the press. It completely eliminates the need to manually stack, weigh and count parts coming off of the press. 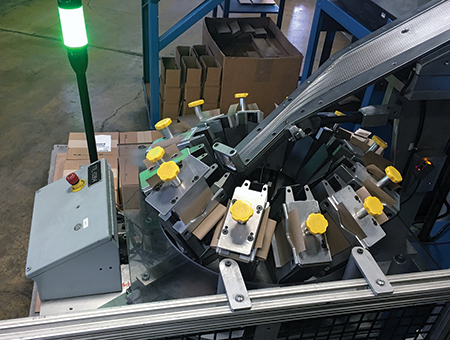 With the development and implementation of the Auto Stacker, Tella Tool increased press speed by 48 percent, resulting in an additional 624 available press-hr./yr. Also, two operators were redeployed to other areas within the company. The improvement yielded a total annual savings of approximately $114,000. The Productivity Award is sponsored by Zierick Manufacturing Corp., Mount Kisco, NY, to recognize outstanding achievement by a manufacturing company in the development and implementation of programs, processes and use of assets that lead to significant improvements in productivity. Excellence in Innovation and Technology—HK Metalcraft Manufacturing Co.
HK Metalcraft Manufacturing Company, Lodi, NJ, received the 2016 Plex Systems Innovation and Technology Award for implementing cloud technology that improved company-wide information sharing and internal communications. As a result, it now gains more information through data with built-in quality checks and live statistical process control (SPC), and enjoys improved operations with more accurate process controls. The company manufactures high-quality precision metal stampings, metal gaskets, spring washers, formed products and related assemblies for industries worldwide. In the 1980s, HK Metalcraft installed a single company-wide enterprise-resource-planning (ERP) system. Nearly three decades later, the company decided to replace its legacy ERP system with a cloud-based solution. Now, HK Metalcraft has serialized container-level inventory, making lot control much more accurate. It also has more finished inventory, less work in process and more detailed process routings. Additionally, HK Metalcraft now can collect data from its plant floor and check SPC on every product dimension to ensure accuracy. The company looks at the part-cost structure and sees the direct overhead, variable overhead and direct labor. As process routings and rates are tweaked, HK Metalcraft looks at part cost structures to find areas of profit or loss. More information on downtime also is tracked. The company’s old press system required operators to manually input downtime with reason codes. With no standards around this process, operators would sometimes enter general codes, leading to inaccurate reporting. In implementing the cloud-ERP system, HK Metalcraft now knows what causes each downtime event, and has an audit trail to pinpoint better solutions. HK Metalcraft continues leveraging cloud technology to build out an Industrial Internet of Things strategy, which includes connected press counters, digital scales, optical inspection systems and shopfloor dashboards to display performance in real time. The Innovation and Technology Award, sponsored by Plex Systems, Inc., Troy, MI, recognizes a metalforming company that has implemented cloud technology to drive innovation from a product or business perspective, transform business operations or leveraged it in order to scale and grow from a size or product perspective in order to emerge as a leader in their industry. Pentaflex used its manufacturing and design expertise to help develop a weight- and cost-saving stamped heavy-truck brake part (left) that replaces a cast part (right). Pentaflex, Inc., Springfield, OH, received the 2016 Ulbrich Award for Excellence in Product Development for developing and processing a stamped brake spider for use in Class 8 trucks. Pentaflex, a contract stamper specializing in deep-drawn, heavy-gauge stampings and welded assemblies for the heavy-truck market, also services the automotive, agricultural, off-highway and defense industries. Pentaflex’s customer had noted an opportunity to introduce a stamped brake spider to replace an existing cast spider, to obtain a significant cost and weight advantage. 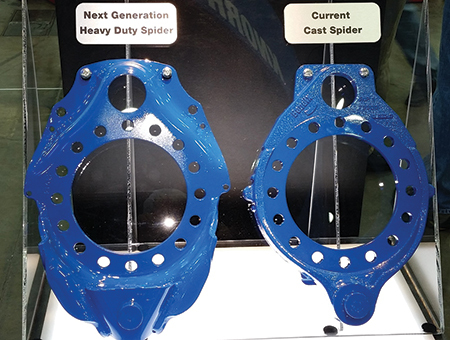 Because brake loads can exceed 26,000 lb., the spiders typically have been manufactured as castings. Pentaflex was integrally involved in supporting the development effort via its manufacturing capabilities in forming, welding, machining and assembling. As developed, the stamped spider is made from high-strength low-alloy steel, offering improved stiffness, strength and durability. To stamp the parts, Pentaflex refurbished a 1600-ton mechanical press, and outfitted the press with a new part-transfer system to support volume production and tight design requirements. Additionally, it acquired new gas-metal-arc welding equipment for assembling straps to the spider, and a new CNC machining center for drilling and aligning the close-tolerance bushing and wheel-mounting holes, and optional ABS-brake slot. A second existing press was then tooled for stamping the wheel-attachment hole pattern into each spider. Pentaflex also undertook a weld-development project, to establish the necessary weld parameters and provide the optimum weld pattern strength and quenching requirements. From release of the first prototypes to the program’s launch in the summer of 2015, Pentaflex has undertaken a continuous product-development effort. It has produced more than 100,000 spiders and now includes more than 80 spider variations for different OEM customers. The cost and weight savings achieved with the development of the stamped spider were significant. Cost savings total nearly $2/part, and the final stamped spider assembly in production results in weight savings of 3 to 6 lb./vehicle. The Product Development Award is sponsored by Ulbrich Stainless Steels and Special Metals, Inc., North Haven, CT. It acknowledges a manufacturing company that demonstrates outstanding innovation in developing and manufacturing a product that best uses metal in place of a nonmetal competitive material, or that develops a product using flat-rolled material that was previously manufactured using costlier manufacturing processes. Excellence in Training and Education —DeWys Manufacturing Inc.
DeWys University, developed by DeWys Manufacturing, offers training in key technology areas including welding, press-brake forming, machining and powder coating. DeWys Manufacturing Inc., Marne, MI, received the 2016 A.R. Hedberg Training and Education Award. The company specializes in lean manufacturing, offering customers complete custom metal-fabrication services, including custom engineering and product development. DeWys Manufacturing won the award for its DeWys University, developed to meet the company’s growing human-resources requirements. The university offers training in key technology areas including welding, press-brake forming, machining and powder coating. These programs provide DeWys with a strong pool of trained and motivated team members with skills that are in high demand. Each of the DeWys University training programs can accommodate one or two trainees per session. The weld-training program, for example, typically has two students who each spend six weeks working hands-on with a trainer. During this time, the trainer evaluates technique, commitment to the company and overall capabilities. After the first six weeks, trainees move to predetermined shifts and departments. At that time, they are paired with mentors to help as needed. The overall process to make a new trainee an efficient welder takes approximately six months. DeWys University works to consistently have new trainees in the pipeline based on open positions. Press-brake forming and welding have been the two most consistent areas for training needs. To enter into these programs, trainees undertake multiple interviews as well as skills tests or mechanical-reasoning tests. The university is meant for new and current team members. Each program has five or six levels that vary based on skills, abilities and years of service. The creation of the inhouse training program has resulted in an increase of team members, wages and overall morale at DeWys Manufacturing, in addition to providing the company with its needed skilled labor. The Training and Education Award recognizes an outstanding achievement by a company in employee technical education through a comprehensive training program. The award is sponsored by HPL Stampings, Inc., Lake Zurich, IL, in memory of A.R. (Ray) Hedberg. Middle Tennessee State University (MTSU), Murfreesboro, TN, received the 2016 Clips & Clamps Industries Educational Institution Award, for its Experimental Vehicles Program (EVP), which provides extensive hands-on experiences gained by creating and assembling vehicles to compete in collegiate competitions. The program consists of five experimental-vehicle projects that split students into peer-led teams that research, design and manufacture original vehicles. On average, 70-80 students per semester participate in the EVP, utilizing the skills gained from the program, including problem-solving, innovation and resourcefulness. Students learn valuable job functions and receive exposure to fabricating machinery. The EVP also gives students practice in presenting their design reports and technical work, allowing them not only to learn technical skills but also communication skills. Does Your Metalforming Company Deserve Recognition? 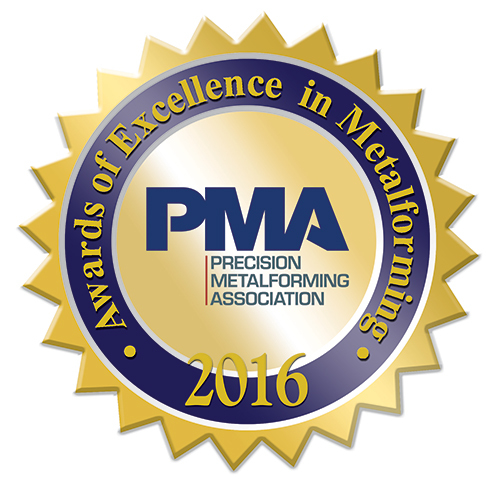 Share your success—and brag a little—by submitting an entry for PMA’s Awards of Excellence in Metalforming 2017. It’s your chance to recognize employees and distinguish your company in the industry. To learn more, visit www.pma.org/awards, or contact PMA’s Pete Ulintz at 216/901-8800, pulintz@pma.org. MTSU’s EVP has exhibited outstanding performance at national and international competitions. Most recently, in 2015 one of the experimental vehicles, the NASA Lunar Rover team, placed first nationally and third internationally. This team also earned the Safety Award and the Neil Armstrong Outstanding Design Award. Several companies in the metalforming industry mentor and support the EVP. And, because of the EVP, metalforming-industry recruiters are eager to hire these new engineers, as they require less training, are more knowledgeable and can utilize problem-solving skills learned in the program. More than 90 percent of students participating in the program have a job lined up in the metalforming industry after graduation.